Observation - Peregrine Feeding - UK and Ireland. 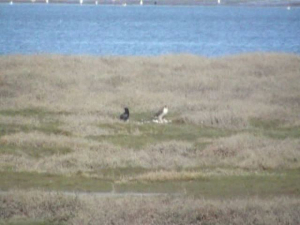 Description: Peregrine falcon [Falco peregrinus] was being 'bothered' by a Raven whilst trying to feed on a recent catch. Peregrine falcon [Falco peregrinus] was being 'bothered' by a Raven whilst trying to feed on a recent catch.